Quick Shopping for ordering rug or sample. Click on the rug photo and click on arrow across from the shape you want. Then Follow check out. DETAILS ABOUT THIS RUG ARE: 3 inch pile, Multicolor, Nylon Fiber. Quick Shopping for ordering rug or sample. Click on the rug photo and click on arrow across from the shape you want. Then Follow check out. DETAILS ABOUT THIS RUG ARE: 2 inch pile, Solid Red, Wool Fiber. Quick Shopping for ordering rug or sample. Click on the rug photo and click on arrow across from the shape you want. Then Follow check out. DETAILS ABOUT THIS RUG ARE: 1 3/4 inch pile, solid yellow color, Nylon Fiber. Quick Shopping for ordering rug or sample. Click on the rug photo and click on arrow across from the shape you want. Then Follow check out. 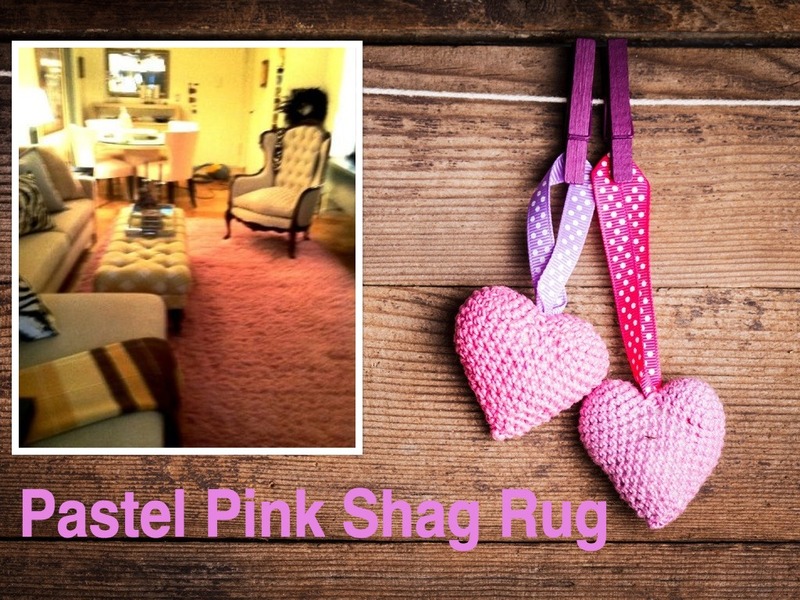 DETAILS ABOUT THIS RUG ARE: 1 3/4 inch pile, solid pink color, Nylon Fiber. Quick Shopping for ordering rug or sample. Click on the rug photo and click on arrow across from the shape you want. Then Follow check out. 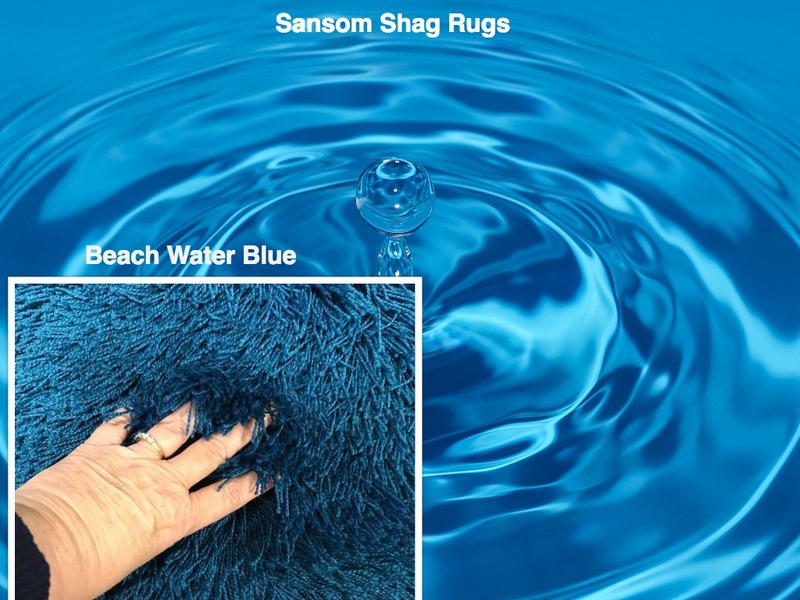 DETAILS ABOUT THIS RUG ARE: 3 inch pile, solid blue color Nylon Fiber. Quick Shopping for ordering rug or sample. Click on the rug photo and click on arrow across from the shape you want. Then Follow check out. 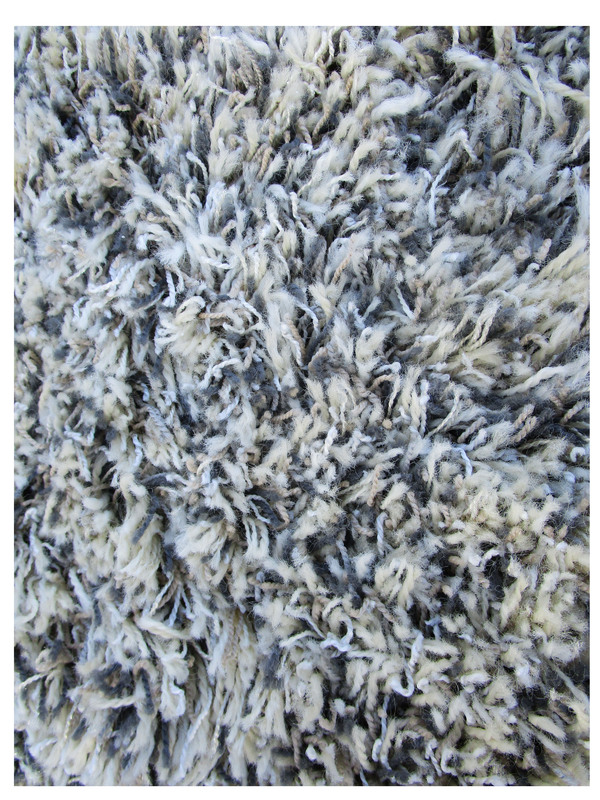 DETAILS ABOUT THIS RUG ARE: 3 inch pile, Medium Beige, Twisted Wool Fiber for less shedding. Quick Shopping for ordering rug or sample. Click on the rug photo and click on arrow across from the shape you want. Then Follow check out. DETAILS ABOUT THIS RUG ARE: 3 inch pile, Deep Dark Rich, Nylon Polyester Fiber. Quick Shopping for ordering rug or sample. Click on the rug photo and click on arrow across from the shape you want. Then Follow check out. DETAILS ABOUT THIS RUG ARE: 1 3/4 inch pile, Multicolor, Nylon Wool Fiber. Quick Shopping for ordering rug or sample. Click on the rug photo and click on arrow across from the shape you want. Then Follow check out. DETAILS ABOUT THIS RUG ARE: 3 inch pile, Solid Color, Nylon Fiber. Quick Shopping for ordering rug or sample. Click on the rug photo and click on arrow across from the shape you want. Then Follow check out. DETAILS ABOUT THIS RUG ARE: 3 inch pile, Bright Burnt Orange Nylon Fiber. Quick Shopping for ordering rug or sample. 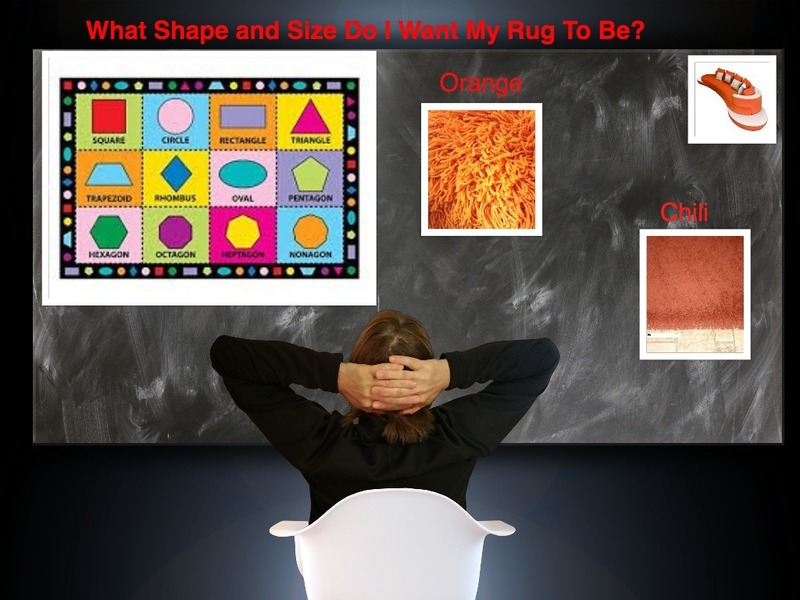 Click on the rug photo and click on arrow across from the shape you want. Then Follow check out. DETAILS ABOUT THIS RUG ARE: 3 inch pile, Multicolor Beige and cream, Nylon Wool Fiber. Quick Shopping for ordering rug or sample. Click on the rug photo and click on arrow across from the shape you want. Then Follow check out. DETAILS ABOUT THIS RUG ARE: 3 inch pile, Off White Grey Mix, Multicolor, Nylon Fiber. Quick Shopping for ordering rug or sample. Click on the rug photo and click on arrow across from the shape you want. Then Follow check out. DETAILS ABOUT THIS RUG ARE: 3 inch pile, Green, Brown, Gold Multicolor, Nylon Polyester Fiber. New color! Quick Shopping for ordering rug or sample. Click on the rug photo and click on arrow across from the shape you want. Then Follow check out. DETAILS ABOUT THIS RUG ARE: 3 inch pile, Brilliant Solid Shinny Beige with Beige, Nylon Fiber. Quick Shopping for ordering rug or sample. Click on the rug photo and click on arrow across from the shape you want. Then Follow check out. DETAILS ABOUT THIS RUG ARE: 3 inch pile, Solid Bright Red, Nylon Fiber. Quick Shopping for ordering rug or sample. Click on the rug photo and click on arrow across from the shape you want. Then Follow check out. DETAILS ABOUT THIS RUG ARE: 3 inch pile, Beige Nylon Fiber. Quick Shopping for ordering rug or sample. Click on the rug photo and click on arrow across from the shape you want. Then Follow check out. DETAILS ABOUT THIS RUG ARE: 3 inch pile, Solid Color Aqua Blue, Nylon Fiber. Quick Shopping for ordering rug or sample. Click on the rug photo and click on arrow across from the shape you want. Then Follow check out. DETAILS ABOUT THIS RUG ARE: 3 inch pile, Solid Rust Color Nylon Fiber. Quick Shopping for ordering rug or sample. Click on the rug photo and click on arrow across from the shape you want. Then Follow check out. DETAILS ABOUT THIS RUG ARE: 3 inch pile, Multicolor Chocolate Browns, Nylon Blend Fiber. Quick Shopping for ordering rug or sample. Click on the rug photo and click on arrow across from the shape you want. Then Follow check out. DETAILS ABOUT THIS RUG ARE: 3 inch pile, Multicolor of brightest shades, Polyester and Nylon Fiber. Quick Shopping for ordering rug or sample. Click on the rug photo and click on arrow across from the shape you want. Then Follow check out. DETAILS ABOUT THIS RUG ARE: 1 3/4 inch pile, Solid Lt. Beige, Polyester Fiber. Quick Shopping for ordering rug or sample. Click on the rug photo and click on arrow across from the shape you want. Then Follow check out. DETAILS ABOUT THIS RUG ARE: 1 inch pile, Brown, Tan and Gray Stripes. Multicolor, Nylon Fiber. Quick Shopping for ordering rug or sample. Click on the rug photo and click on arrow across from the shape you want. Then Follow check out. DETAILS ABOUT THIS RUG ARE: 1 inch pile, Multicolor, Nylon Blend Fibers. 3 inch tufted. Country blue is a wool rug. Its a medium denim blue. For a sample click on the picture, scroll down to item options. Email or call 706-673-4999 customer service 9:00 - 5:00 Eastern time. 3 inch tufted pile. Polyester blend yarn. Light shades of off whites and lt. Crème. 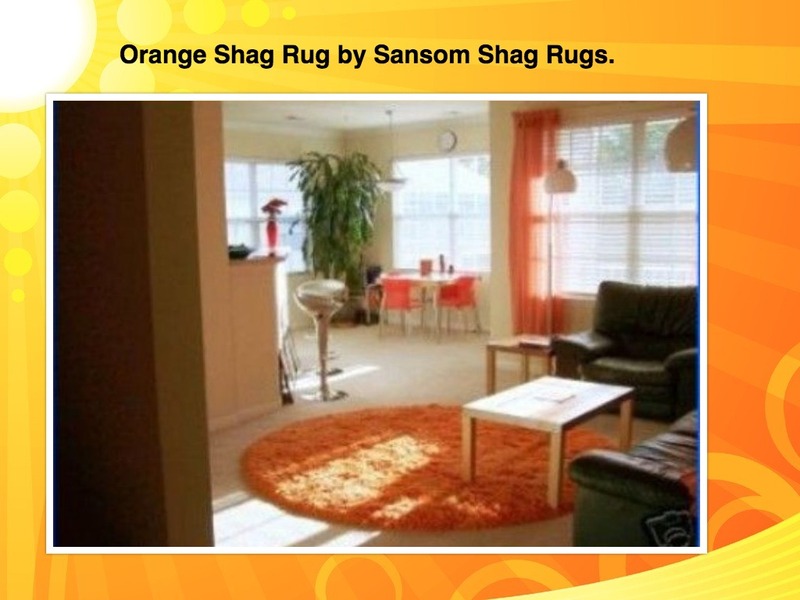 For a sample click on the rug photo. Scroll down to item options. Click on the arrow across from the shape for prices and shapes. 3 inch tufted Pile. Dazzel is a solid rasberry purple color. 2 Inch Pile Semi Shag Pure White. Dragon Tail, 3 inch Shag Rug. Nylon and Wool Blend. 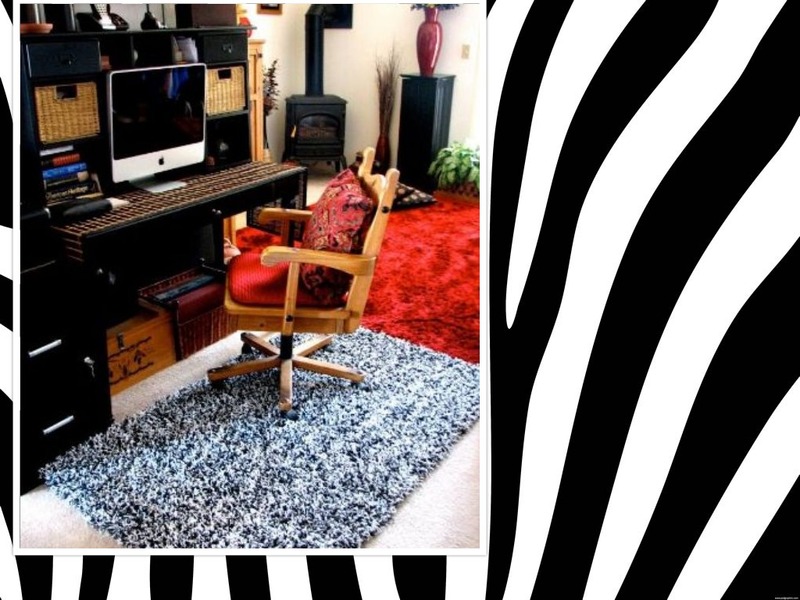 Colors arrayed in this rug is mainly Lt. Beige with Burgundy, Turquoise, rust, sage green and several other shades. This rug is Luxurious! 3 inch tufted pile. Eggshell is a light off white color. For a sample click on the picture, scroll down to item options, click on the arrow. For More info. Email or call 706-673-4999. Customer service is available, 9:00 a.m. to 5:00 Eastern time. 3 inch tufted pile. For a sample click on the picture, scroll down to item options, click on the arrow. For More info. Email or call 706-673-4999. Customer service is available, 9:00- 5:00 Eastern time. 1/8 thick Felted Rug Pad. Superior Quality! The best of the best! We also do custom sizes. Email us with your custom size needs, for a quote. Samples available are available. 706-673-4999. 3 inch tufted pile. Garnet has burgundy, Bright Gold and brown. 3 inch tufted pile. Gold is a big yarn and smaller yarn. For a sample click on the picture, scroll down to item options, click on the arrow. For More info. Email or call 706-673-4999. Customer service is available, 9:00 a.m. to 5:00 Eastern time. 3 inch tufte pile. Haystack has taupes, cremes and beiges. For a sample click on the picture, scroll down to item options, click on the arrow. For More info. Email or call 706-673-4999. Customer service is available, 9:00 a.m. to 5:00 Eastern time. Horizion, 3 inch nylon fibers. Samples available to buy. Click on the picture, scroll down to item options, click on the arrow. More information? Contact us tab at top of page or call 706-673-4999. 9:00 a.m. to 5:00 p.m. Eastern time. 3 inch tufted pile. For a sample click on the picture, scroll down to item options, click on the arrow. For More info. Email or call 706-673-4999. Customer service is available, 9:00- 5:00 Eastern time. a solid red burgundy. 3 inch tufted pile. Island is Creams, brown and Lt. Tans. For a sample click on the picture, scroll down to item options, click on the arrow. For More info. Email or call 706-673-4999. Customer service is available, 9:00 a.m. to 5:00 Eastern time. 3 inch wool Micro Fiber. Ivy Trail, 3 inch nylon fibers. Samples available to buy. Click on the picture, scroll down to item options, click on the arrow. More information? Contact us tab at top of page or call 706-673-4999. 9:00 a.m. to 5:00 p.m. Eastern time. Kaladescope, it a 3 inch tufted multi color. Wool Blend. 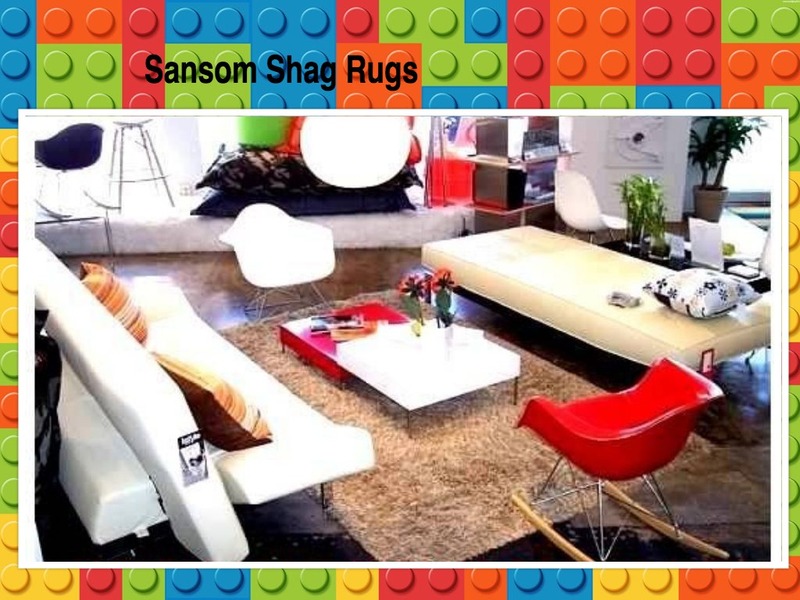 For samples and rug prices. Click on the picture and scroll down to item options. Click on the arrow beside of the shape and follow check out. 3 inch tufted Lilac Polyester. Its lighter than the Purple. 3 inch tufted pile. Lime is a solid medium green. For a sample click on the picture, scroll down to item options, click on the arrow. For More info. Email or call 706-673-4999. Customer service is available, 9:00 a.m. to 5:00 Eastern time. Merlot is a 3 inch tufted shag rug with line Swerves of beautiful thick yarn such as Burgundy, Wine and Mauve shades. Multi- Color. Fluffy polyester, created for the designer in all of us! 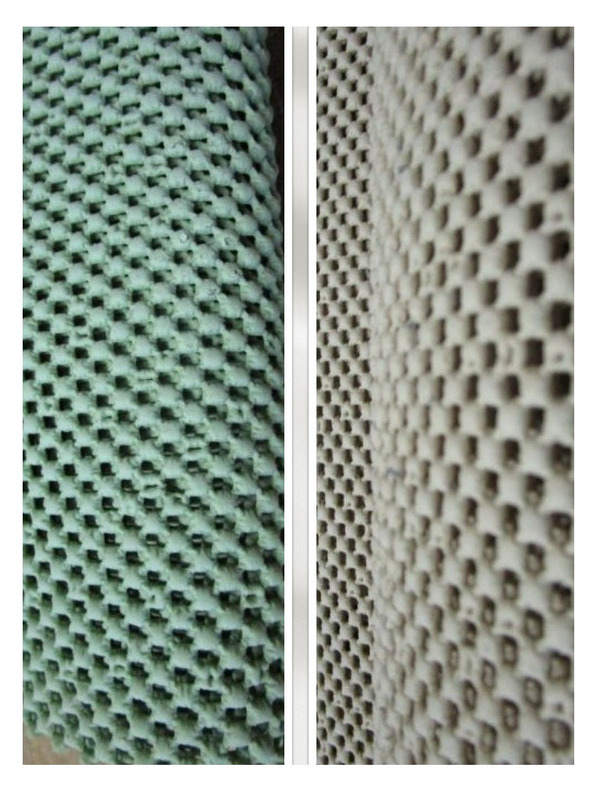 3 inch tufted Nylon and Polyester mix. Grey Taupe, Shinny Gold Wrapped with Chocolate Brown, Lt. Cream With Swirled Carmel. New Shade. Samples $5.25 order online or call 706-673-4999. 3 inch tufted pile. Navy Solid dark navy blue.For a sample click on the picture, scroll down to item options, click on the arrow. For More info. Email or call 706-673-4999. Customer service is available, 9:00 a.m. to 5:00 Eastern time. 3 inch tufted pile. Orange is bright. For a sample click on the picture, scroll down to item options, click on the arrow. For More info. Email or call 706-673-4999. Customer service is available, 9:00 a.m. to 5:00 Eastern time. Orchid is bright polyester varigated yarn with shades of Turquoise, Purple, Plums, shinny white, with hints of grays. You gotta see a sample! Click on picture for prices or sample. 3 inch tufte pile. Pastel Pink. It's a light shade. For a sample click on the picture, scroll down to item options, click on the arrow. For More info. Email or call 706-673-4999. Customer service is available, 9:00 a.m. to 5:00 Eastern time. 3 inch tufted. Lt. Blue Nylon. 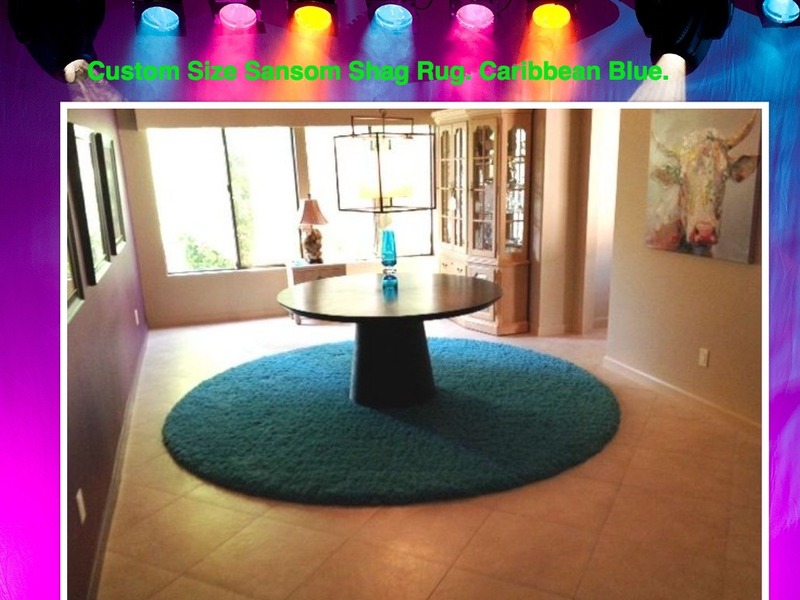 For a sample click on the rug picture and scroll down to item options. Click on the arrows across from the shape or call 706-673-4999- 9-5 EST. 3 inch tufted pile, Mulit-Color with Grey, Brown off white. For a sample click on the picture, scroll down to item options, click on the arrow. For More info. Email or call 706-673-4999. Customer service is available, 9:00 a.m. to 5:00 Eastern time. 3 inch tufted pile. Pink is a bright solid color. For a sample click on the picture, scroll down to item options, click on the arrow. For More info. Email or call 706-673-4999. Customer service is available, 9:00- 5:00 Eastern time. 3 inch tufted. Solid rich deep dark black, brown and beige. 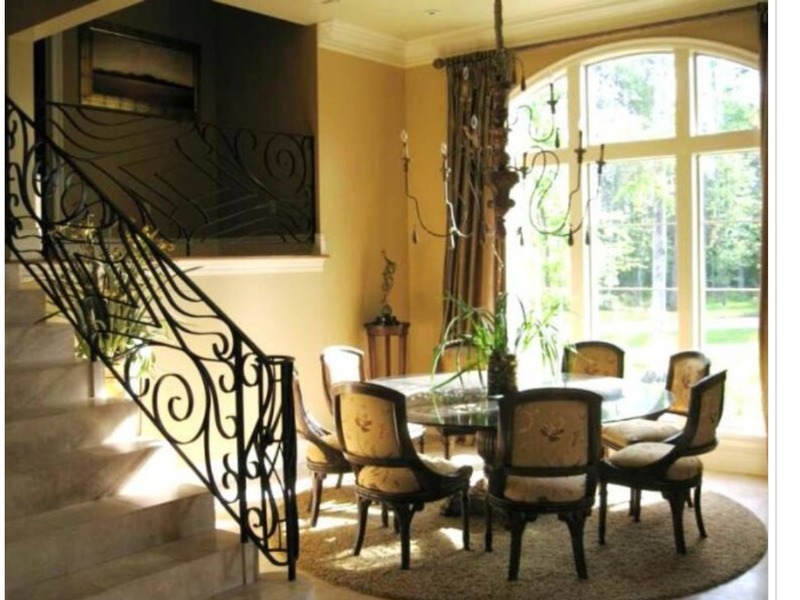 Samples are available email us or call us at 706-673-4999. Customer service is available Monday-Friday 9:00 a.m. to 5:00 p.m. Eastern Time. 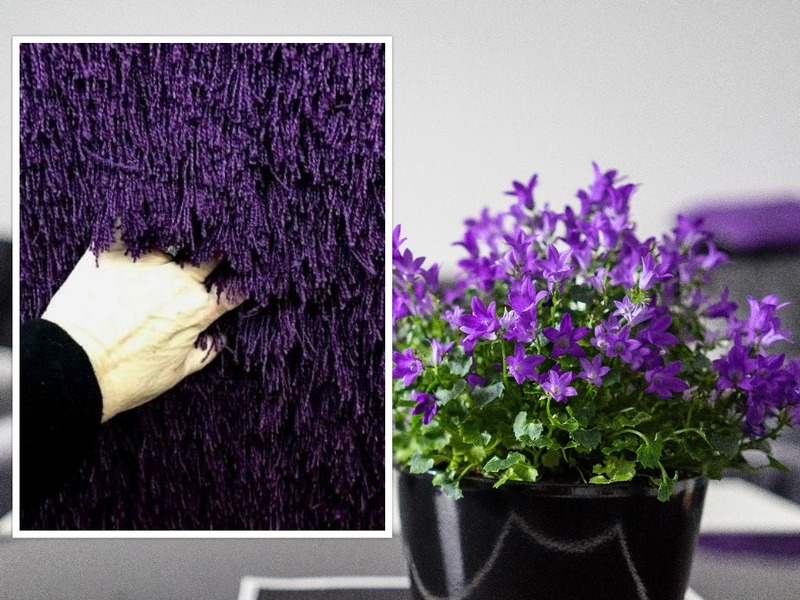 3 inch tufted pile, Purple is a solid color.For a sample click on the picture, scroll down to item options, click on the arrow. For More info. Email or call 706-673-4999. Customer service is available, 9:00 a.m. to 5:00 Eastern time. 3/8 Thick Waffle Rug pad. 3 inch tufted pile. 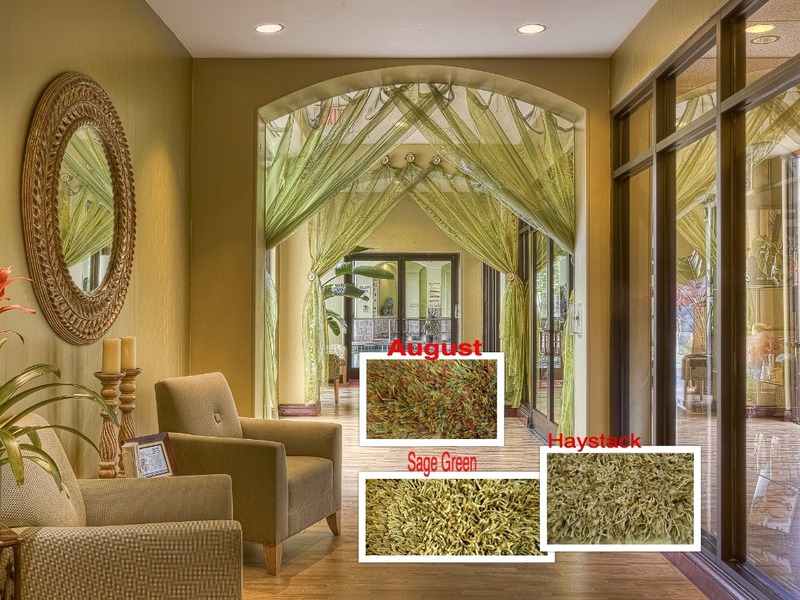 Sage is a medium solid army green color. Salt and Pepper, 3 inch Nylon fibers. Black and White mix. Sara, Is a Polyester tufted 3 Inch pile. Nylon Blend Yarn. Beige, Crème, warm Honey shades and Sage Green. Light color mix with Fat Yarn. 3 Inch tufted shag rug. Multi shades of Grey. For a sample or to view prices. 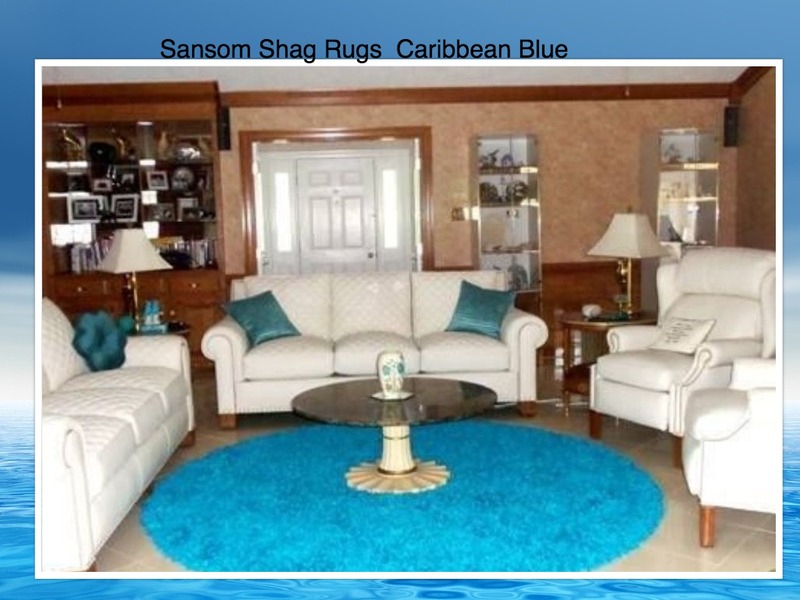 Click on the rug photo and scroll down to item options. Click on the arrow across from the desired shape. Highlight with mouse and then keep shopping or check out. 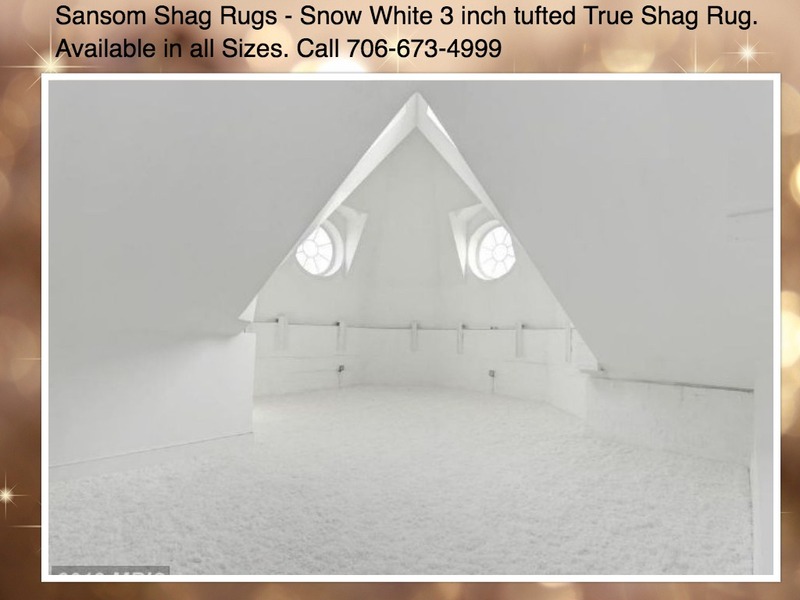 3 inch tufted, Snow White is the whitest of all whites. It is beautiful and heavy. You can purchase a sample to see. Click on the picture, scroll down to item options, click on the arrow. Email or call us at 706-673-4999. 3 inch tufted twisted and heat set Wool Yarn. A medium Soft Shade of Beige. 3 inch tufted pile. Sunset has creams, beiges, sages, rust pumpkins. Tea Time is a Multi-Color 3" Tufted Nylon. 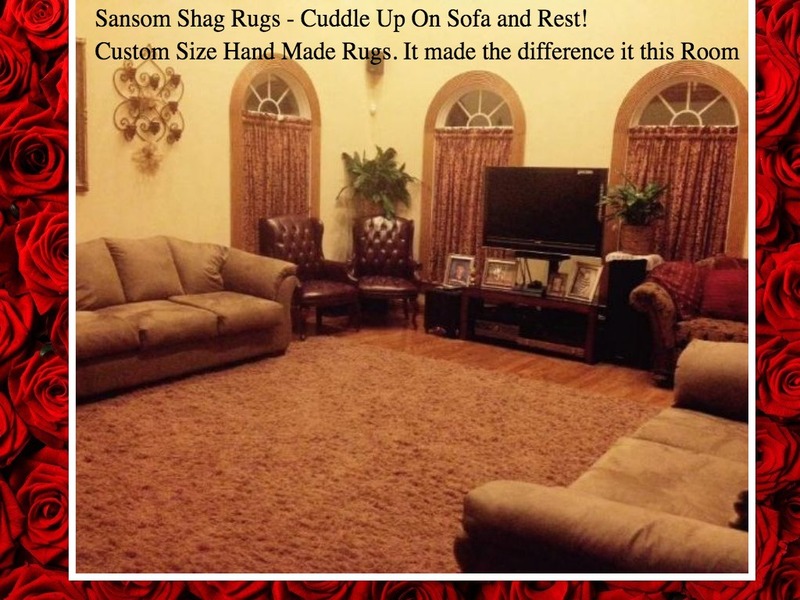 For a sample click on rug photo, scroll down to item options, click on the arrow Or call customer service at 706-673-4999. Hours are 9:00 a.m. to 5:00 p.m. Eastern Time. 3 inch tufted, polyester multi bright shades of Lime, Orange, Pink, Yellow, white, blue, pink, purple. 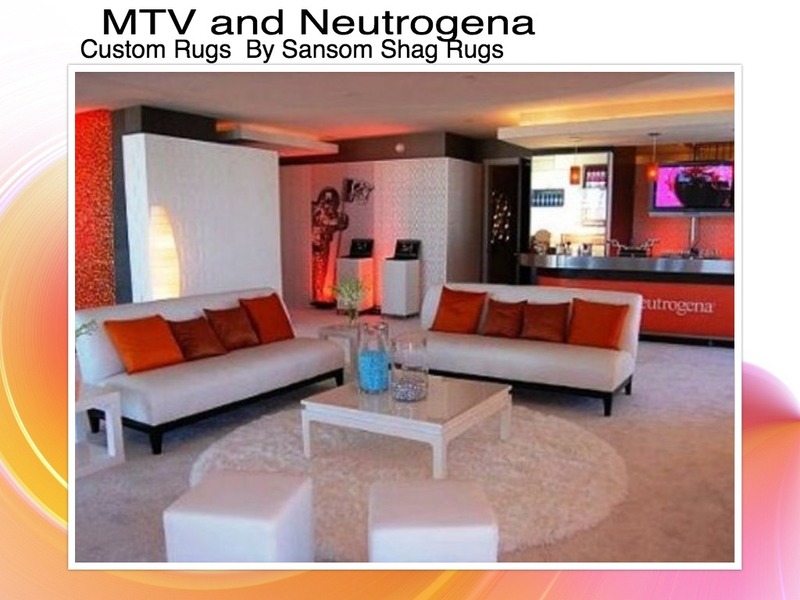 Samples available, click on the rug photo. Scroll down to item options. Click on the arrow across from the shape and follow check out. Fun shades. 3 inch tufted pile. Yellow is a bright happy solid color. For a sample click on the picture, scroll down to item options, click on the arrow. For More info. Email or call 706-673-4999. Customer service is available, 9:00- 5:00 Eastern time.